A Philadelphia architecture firm has cut energy use in half by moving into the historic building. 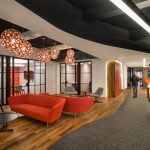 When KieranTimberlake, a Philadelphia-based architecture firm, was looking to move into a new office, they wanted to put their commitment to research and sustainability to the test. They identified an old bottling plant, located in Philly’s Northern Liberties neighborhood, as the perfect sandbox where they could implement new energy saving techniques. Originally built to be self-ventilating, the building allows natural light to flow in through the tall windows, and the wide open floors are especially suited to 21st century workflows. We reached out to the team at KieranTimberlake to find out more. KieranTimberlake retrofitted the building, which was originally designed by Richard Koelle of William F. Koelle & Co.
With a desk count of 115, each employee has 55 SF of “assigned space”, however there are many flex areas throughout the first and second floor, including breakout spaces, lounge spaces, a swat room, maker space, fabrication labs, and conference rooms. The flex areas total 30,000 SF and therefore unassigned flex space per employee is 205 SF. About 100 employees, daily population fluctuates +/- 100 when people are traveling (fewer people) or when we have client meetings (more people). The location has a Walk Score rating of 95. The office is accessible to local and regional rail lines, several bus lines, and a network of bike lanes for commuting. 70 percent of the occupants use public transportation or bike. Secure, indoor bicycle parking and showers are provided. Tell us about the furniture. Please touch upon any notable products, how they were used, and if they solved a specific problem. Wheeled desks integrate computer equipment and personal surge protectors so each workstation can be rolled to a new location and easily plugged into floor consoles, promoting a fluctuating, collaborative office culture, where ad hoc teams can reorganize swiftly. Each employee has a task lamp that has been tailored in-house to support LEDs instead of halogens, which greatly cuts down on heat-gain and power consumption. Most employees are here every day, unless traveling to an architectural project site. A large percentage of the space is unassigned, though a better word would be flexible. The first floor is mainly open and thought of as a “maker space,” with a section that is equipped with technology utilized for all-staff gatherings, presentations, or open-house events. The firm grounds its design process in a code of research and sustainability ethics, which is reflected in their incorporation of sustainable interventions, such as fundamental improvement to the existing envelope, daylighting, and passive mechanical systems to reduce energy use. At the same time, a respect for the building’s history is reflected through the reuse of aesthetic and functional elements remaining from the building’s factory days. A former loading dock at the front of the building was converted to a shop, making use of the space’s original form, and putting the act of making in full view, reflecting the firm’s mission to foster hands-on experimentation. The second-floor studio is open and non-hierarchical to support the firm’s essential acts of collaboration. Conference rooms and break-out spaces with writable walls flank the east side of the office. Partitions, which also serve as pinup space, can be moved to create larger or smaller rooms as required. To promote hassle-free mobility, the second floor is made up of tiles raised on a stilt-like plenum, with air vents, sensors, data and electric wiring beneath. Adjustable floor vents are also inset, giving the option to customize airflow. The second-level studio has high ceilings and a restored ceiling monitor that runs down the center of the studio, tracking daylight like a sundial. Even on cloudy days, natural light streams in from all directions and exponentially reduces the need for electric lighting. The windows throughout the building are also fully operable. 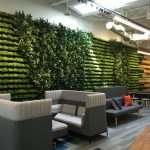 The firm updated and emphasized these original design elements in order to create an environment that incorporates the refreshing reminder of the outdoor world, a proven factor in creating a more positive place to work. Designed to be flexible and adaptable, the building and its interiors operate as a supporting shell in which an ever-shifting variety of experiments can take shape. New commuting patterns, and adjusting to the presence of new spaces that change working habits (a welcome adjustment, but an adjustment nonetheless). Operating from the standpoint that the most effective way to reduce carbon emissions is to repurpose an already-existing building, the firm chose this building for its intrinsic potential to save energy. The former bottling house was originally built to be self-ventilating. Its open floor plan and tall interior spaces allow heat to rise to the second floor and follow the sloped roof to the monitor, where it can exit the building through operable windows. These elements, combined with the energy-storing capacity of thick concrete factory floors, afforded a platform to further implement new energy-saving techniques. The firm can take advantage of the building as a test-bed to further fine-tune their systems and behaviors, using the sensor network, and a staff survey aggregator, to develop a body of knowledge that can be used in future projects. Still in its first year of use, the building is functioning with less than half of the energy typically expended by an office of comparable size. The firm can take advantage of the building as a test-bed to further fine-tune their systems and behaviors, using the sensor network, and a staff survey aggregator, to develop a body of knowledge that can be used in future projects. Historic Preservation Consultants: Jon Milner Associates, Inc.
All photos courtesy of KieranTimberlake.